What is a Porterhouse Steak? 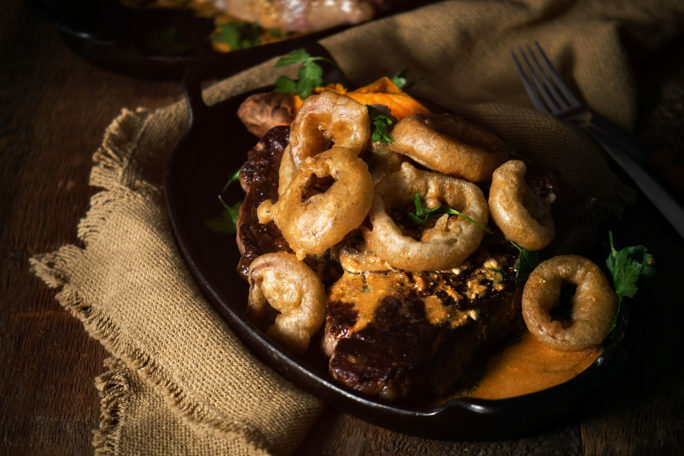 A T-bone, strip and tenderloin, steak divided by the defining ‘T‘ shaped that is greater than 1 1/4″ thick and possibly next to only the Cowboy Steak – one of the prettiest for plating. 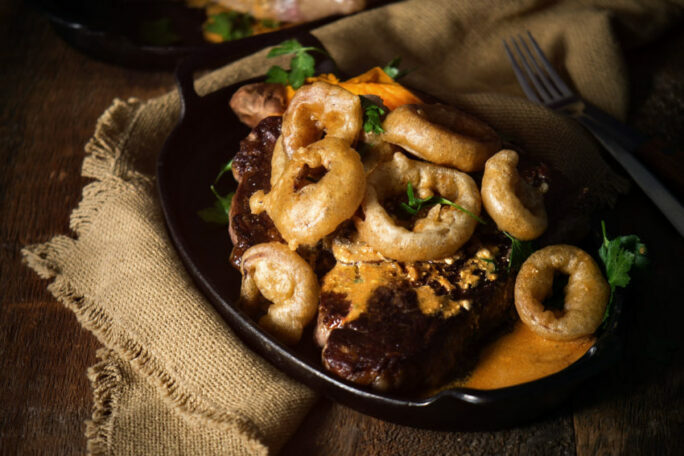 Ideal for pan searing, the porterhouse steak gives premier restaurant presentation but is easily over or undercooked due to its size, leaving you staring down an expensive giant slab of beef. 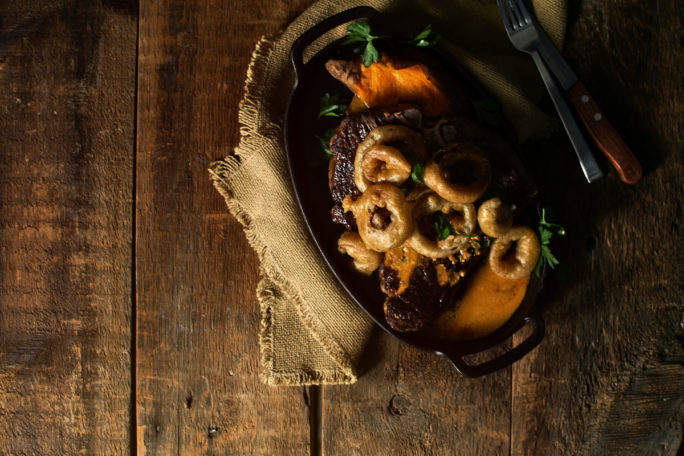 Luckily, using both the cook top and the broiler, the mystery of the Perfect Pan Seared Porterhouse is something any date night can take on. There is something about the steak that reminds me of cheap dates and former flings. Coming out sizzling, but often not living up to expectations and an egregious waste of time and money. A steak is a thing to be cherished. A special event. It’s a well cut prime slab of choice meat that was aged and cared for before it even hit your kitchen counter. There are the bulk rough cuts of a busy market butcher, which should be reserved for those hot and fast nights that we have all had. And then, there are the clean patient cuts that a butcher is going to give you when you really know what it is you are looking for. No one’s going to turn down the quick cheap cut, over time and as your taste evolve, you learn how to make those thick prime cuts worth every penny you spent on them. For this perfect pan seared porterhouse steak, start with a good oven safe skillet. You want a heavy cast iron skillet – the one that weighs a ton and has a lot of love soaked in. 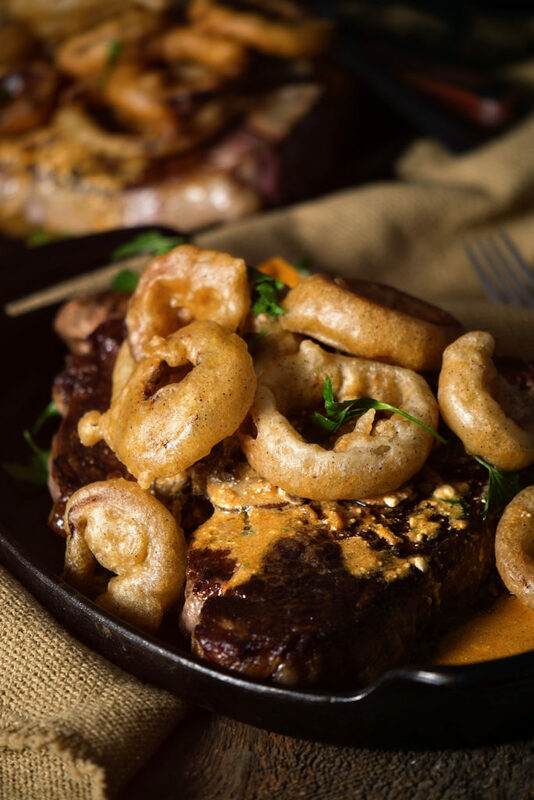 When it’s hot and ready to go and the broiler is rolling steady kicking out some heat, you’ll be working quickly with the heavily salted porterhouse steak to create the perfect sear on the outside before finishing off in the oven to a fork tender medium-rare. The onion rings, sides, and sauce all need to come together at the same time. Have everything prepped and timing in check before even attempting this as a one man act. Now for that perfect pan seared porterhouse recipe. I would prep the sauce and have the onion rings ready to fry the moment you put the steak under the broiler. Timing for this dish is everything. Season your steak well with salt. Slide the oven rack to the middle top position and preheat your broiler so that it's got steady heat going. Meanwhile, heat a heavy cast iron skillet over medium-high heat until it is smoking hot. Place the steak down and cook without bothering for 4 minutes for a nice crust. Flip the steak and put the butter on top. Slide under the broiler and cook for another 4 to 6 minutes depending on how thick your steak is. Remove from oven and allow to rest, covered in foil, before serving for slicing. Top with juices from pan. In a large skillet, melt the butter over medium heat. Saute the onion 5-7 minutes until soft. Add the mushrooms and cook another 5-7 minutes longer, until the water has been released and absorbed. Add in the garlic and cook for 30 seconds. Stir in the paprika and tomato paste and mix to coat everything. Add the flour and cook for 30 seconds. Add the brandy and quickly scrape up any browned bits, stirring and scraping the bottom of the pan as needed. Slowly whisk in the beef broth, being sure to not allow any clumps from the flour, and bring to a simmer. Let cook and reduce by half. Off heat, stir in the sour cream and parsley. Season with salt and pepper. In a large Dutch Oven with high sides, heat enough oil for frying. Whisk the flour, paprika and sparkling water together in a large bowl and season with salt and pepper. Dip the onion rings and toss to coat. Carefully place a few rings at a time in the hot oil and fry until golden and crisp, about 3 minutes. With a metal basket, remove onion rings and cool on a paper towel lined plate. 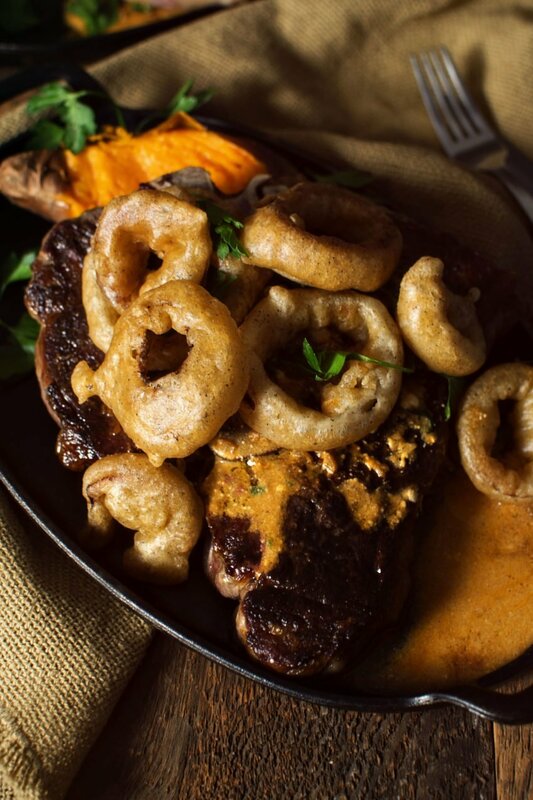 To serve, arrange the steaks on platters with sauce ladled over top and onion rings piled high atop it all. Season and serve. That steak looks absolutely delicious.